When I was a kid, history was one of my educational "hooks". I loved learning about what life was like in different times, places, and situations. I loved imagining myself right alongside the historical figures, experiencing what I was reading. Madison appears to be the same way. She loves the idea of "if you were growing up in ___" or "if you visited _______ hundreds of years ago" and loves comparing her life to what once was. History doesn't feel like a chore to people like us - it's a story. 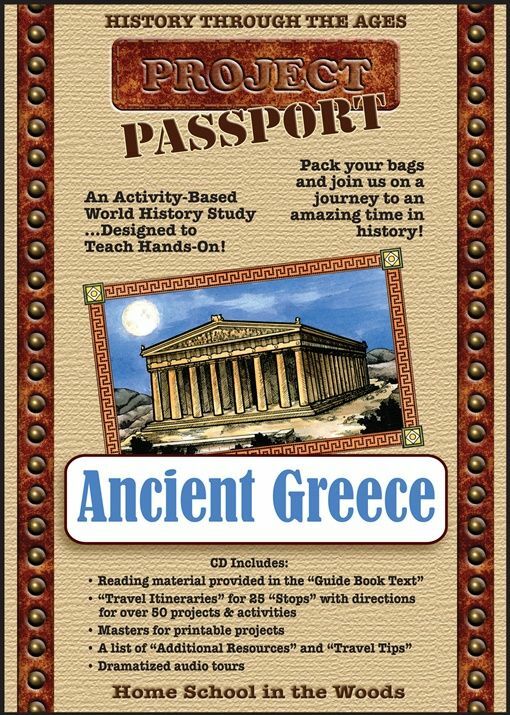 So we were excited to get to review HISTORY Thourgh the Ages Project Passport World History Study: Ancient Greece. It was so interesting to dive into this hands on history program from Home School in the Woods. This is a downloadable product (although you can order a CD-ROM for Windows or Mac) and intended for students in grades 3-8. Madison, as a first grader, is a bit outside the range, but one of the great things about this sort of program is that it can be modified to fit almost any student. Although my preschooler was not an active participant, even she was interested in what we were doing, and if she'd wanted to, I probably could have modified further. Ideally, to use the program exactly as directed, I think the grade range is accurate, and a fifth or sixth grader is probably in the sweet spot. The premise is that you are traveling to this civilization, and so the distinct lessons are called "stops" to keep with the theme. There are twenty-five "stops" along the way. If you do a "stop" a day, 2-3 days a week, the program will take 2-3 months, but we went much more slowly - taking a few days to do each "stop" and not trying to tackle more than one stop a week. Each stop has plenty in it, from the "itinerary" (the teacher instuctions) to the "guide book" (student text) with photographs, projects, and an audio tour. The audio tours were Madison's favorite part. She loved to curl up with the headphones. Like I said before, Madison is only in first grade, so we had to modify. A curriculum that is easy to adjust is a huge benefit of this program. Madison has big interests, and the idea of having to wait because her reading and writing skills haven't caught up yet drives her crazy. In a lot of ways, that's why we homeschool! 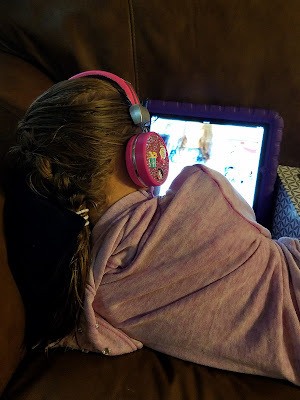 If she wants to learn about ancient civilizations, I don't need to tell her that they'll cover it in in sixth grade, when her excitement may have waned. A program like this gives you the map (no pun intended) and you take your time on the path. Rather than make sure we covered each bit of each stop, we looked at each stop as a buffet, like we were truly spending a day of a vacation there, and we picked what looked best to us. On one day, we happened to get together with some friends, and we had them join in on a project, which was definitely fun. When you're working with first graders, things often don't look as pretty as they can. But the process was fun. No program is perfect though, and there were things that I didn't love. I like pre-printed products - the slightly higher cost upfront is worth it to me both in time and printing costs. I'm not terribly good at crafts and this program for a younger child required a lot of prep work on my part. This program was also very heavy on what needed to be printed, along with a good amount of supplies needed. Card stock, colored paper, file folders - the costs did add up and the time required for prep was overwhelming. Even if Madison had been able to do more of this, a good portion of our time would have been spent on prep work, not active learning. But overall, even for a young student, it was a fun way to truly dive into history. 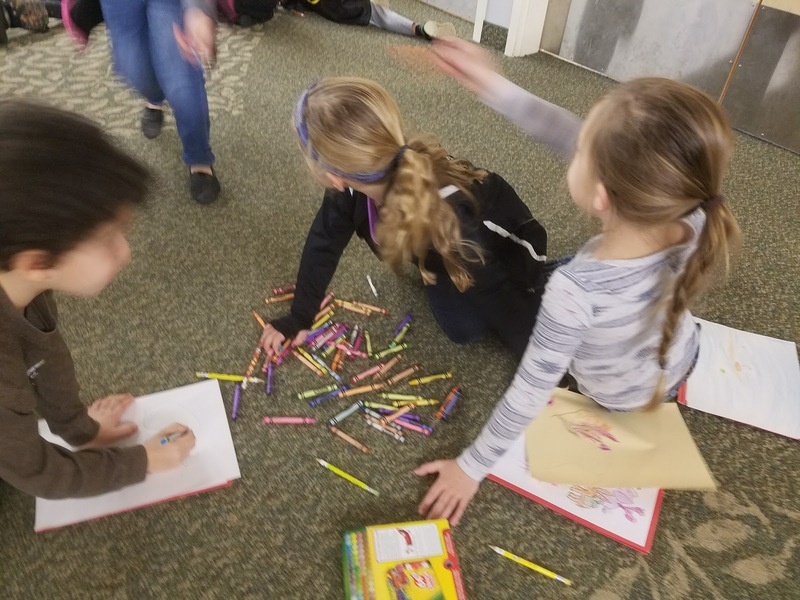 We didn't come close to finishing in the few weeks we worked on it, but it did inspire some interest in ancient cultures that we explored during our next library visit. The extension opportunities are definitely there. Ancient Greece is the newest product, but next year, Ancient Rome will be added, which I'm sure will be just as intriguing! I think we'll wait until both girls are a bit older to tackle another, so that they're able to do more on their own. I liked participating, but I had to take a much more active role than I think is intended. But once we're there, this will be a great way to study history.